"Adverb clauses of time give me a headache," an ESL student of mine once moaned. 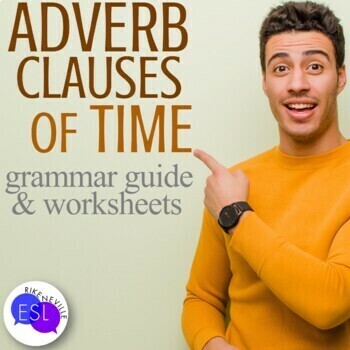 I created this grammar guide with that student in mind, to simplify and clarify adverb clauses, and all of my students since then have had an easier time. 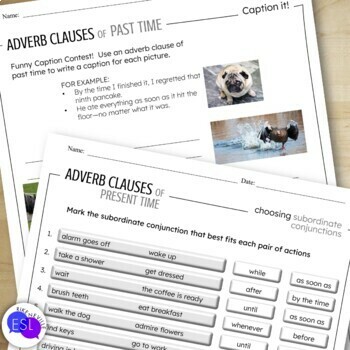 Each has sentence examples with explanations to help students understand how to use adverb clauses of time (past, present, and future) to create complex sentences. The sentences are color-coded and use each of the following subordinating conjunctions: after, when, until, before, once, while, as soon as, whenever, & by the time. 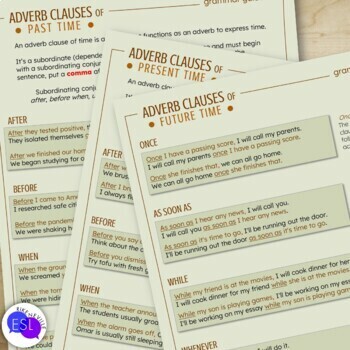 These grammar guides are ideal for student self-study sessions, student discussions, and as supplementary material for any lessons involving adverb clauses of time or subordinating conjunctions. 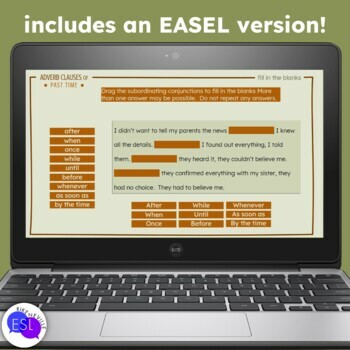 These grammar guides are designed for high-beginning to low-intermediate level adult ESL students. Although no TpT credit is given for feedback on freebies, it’s certainly an incentive to create and provide more freebies! Follow me to be among the first to know about my new freebies and resource launches.